Custom Kids Closets Design for Your Little One, or Two! A kid closet should be designed differently than an adult closet. For one thing, it must be much more flexible and able to accommodate changing needs — as your child (or family) grows, so should their closet. 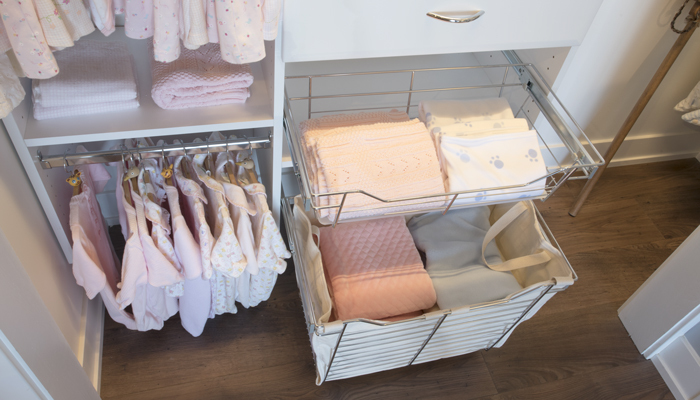 Having a bundle of joy (or two) also means having a bundle of tiny clothes and baby accessories — usually in excess with all of those presents you received from your shower. This reach-in closet organization system accommodates daytime to goodnight storytime, and everything in-between. Designed to meet the needs of multiple children, it basically offers space for everything. 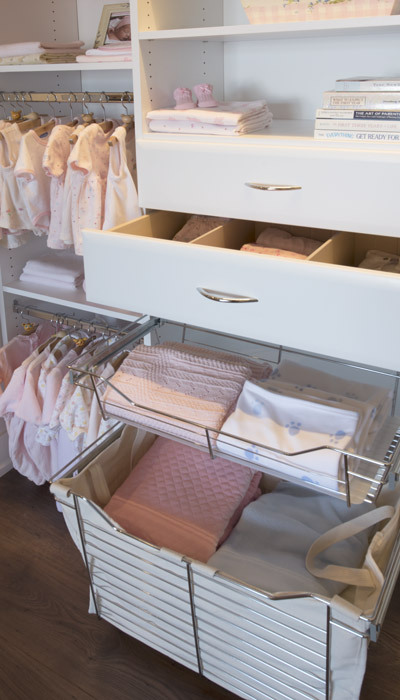 The adjustable hanging rod sections adapt to a growing baby's sleepers and everyday clothing with shelf space below for more items such as those little shoes. With a large pull-out canvas-lined wire basket hamper, the unit eliminates the burden of a hefty plastic hamper getting in the way. As the children grow, it will be a great place to hang pajamas and bathrobes within the child's reach. 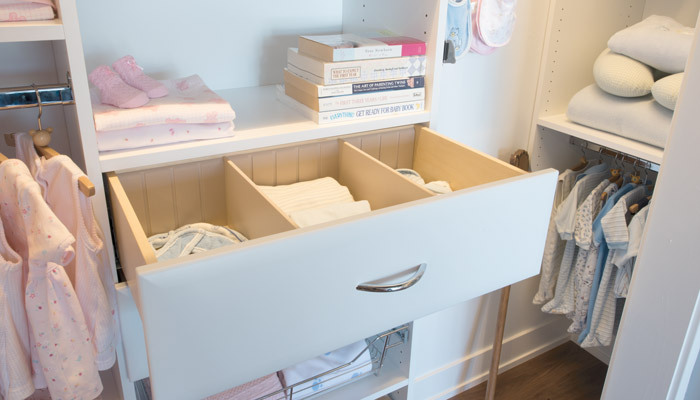 A pull-out wire basket drawer allows easy access to blankets and towels and contrasts nicely against the soft white laminate. After bath time, those towels can hang on the Polished Chrome Classic hooks to dry next to clean bibs. Dividers are provided in the drawers for organizing smaller items such as socks and hats. A divider on the upper shelf aids in organizing larger items such as bags or toys. To top off this thoughtful custom design, the deep return on this kid closet has been turned into an alcove that maximizes the space and includes clothing storage to accommodate a new baby brother or sister. The structural white rail in the top, back of the system anchors this kid closet to the studs. This rail is paintable, allowing the possibility of covering it with a little touch-up paint in the wall color. Exercising this option would make the closet rail virtually disappear. 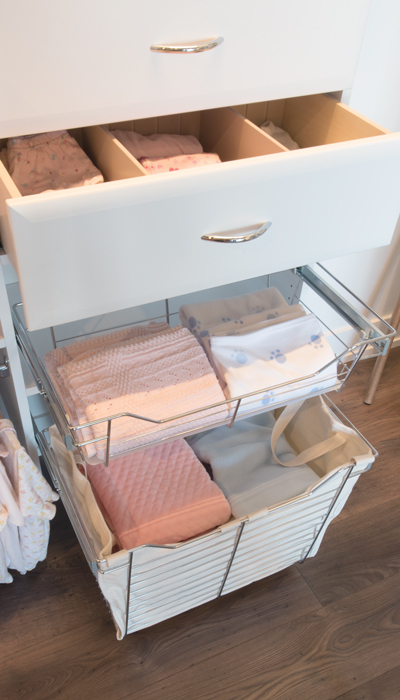 Pull-out baskets for baby blankets, towels or soiled clothing. Drawer dividers organize smaller clothing items in this kid closet. This custom design provides plenty of drawer and hanging space. The pull-out baskets create an interesting contrast with the soft white laminate. This kid closet design offers maximum storage capability for one or more children.